Q: Why did you choose Emergency Medicine? I enjoy helping people, and emergency medicine provided the opportunity to help people in times of stress or great need. My children or people who know me would say I’m a pretty calm, gentle guy – I like bringing that calm to chaotic environments, giving folks a little peace in their time of stress. Q: What drew you to Elite Care Emergency Room? Hospital-based ER’s have definitely become crowded and stressful places to work. In particular, requirements for documenting on a computer-based chart, along with federally required timing and “quality” measures, ironically have made it that I have minimal time to speak with the patients and families. 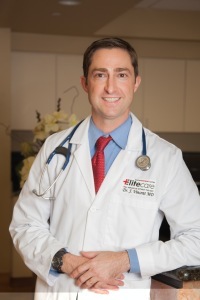 I have always loved the vision of Elite Care providing the best care, by physicians who are trained in ER medicine, with all of the same equipment, but in a classy and quiet environment. Q: How is working at Elite Care any different than your experience working in a main hospital Emergency Department? The rooms are quiet, and unless we’re having an exceptionally busy day, most orders can be started within just a few minutes. I might could summarize the experience of care as being fundamentally efficient. At EliteCare, we have one doctor, one or two nurses, and a radiology tech. Our pharmacy and lab are literally a few feet away. Communication occurs either immediately as I walk out of the room since we are so close, or via an electronic chart designed for efficiency in an ER. Medications are given, labs started, and x-rays or CT’s performed sometimes before I have even finished entering them into the computer. This is a fantastically satisfying way to provide care, as I can spend my time focusing on the patient, and orders are implemented very rapidly. Q: What is the most important thing the public needs to know about Elite Care Emergency Room? I think it is very confusing trying to access healthcare nowadays, with doctors’ clinics, grocery store clinics, urgent cares, free-standing ER’s, and hospital based ER’s all presenting themselves as options for unscheduled care. Each option then has variability in resources and tests available; in who is providing the care (nurse practitioner vs. physician) and in their comfort level treating various conditions; in how long it takes for tests to be resulted; and perhaps most confusing of all, how much will insurance cover, is the provider in-network or out-of-network, what is the copay, and will there be any bill to pay after insurance coverage? My advice would be that it is important to know that EliteCare ER will trigger the ER copay and payment schedule, just like a hospital-based ER. With this in mind though, EliteCare is able to provide the highest tier of care, with ER trained physicians providing all of the care, who all have comfort in the full spectrum of problems, from complex lacerations, fractures, chest pain, and complications of chronic medical conditions. We also have on-site availability of labs, x-rays, and CT scans, which are typically resulted in just a few minutes. This translates into an experience for patients and families where they can come to just one place for all of their diagnostic and treatment needs.